What happened to Red Cross donations for Haiti? Following a harrowing earthquake that struck Haiti in 2010, the American Red Cross launched a project to raise funds and rebuild the area. Roughly $500 million was donated. The Red Cross claims to have provided homes for more than 130,000 people in Haiti, but according to a new report from ProPublica and NPR, as it stands today, only six homes have been built in the four years since those efforts began. Read the full report on Pro Publica’s website. And watch Jeffrey Brown’s conversation with Laura Sullivan. 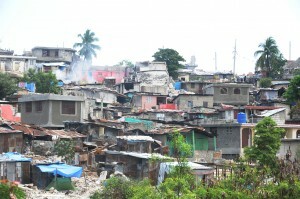 Left: Homes destroyed in the January 12 earthquake are seen in the Avenue Poupelard neighborhood of Port-au-Prince on April 21, 2010. Photo by Thony Belizaire/AFP/Getty Images.